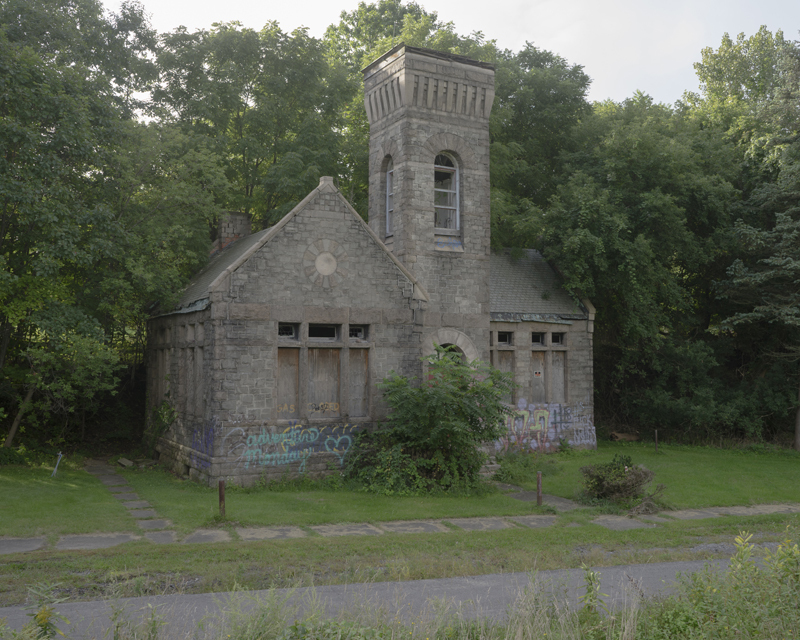 Oakwood Cemetery is one of Central New York’s most significant historic landscapes, but the privately-owned property faces numerous preservation issues, especially at the abandoned entrance area adjacent to Interstate 81 that contains the main gate, office building, and chapel. PACNY has chosen to spotlight the Oakwood entrance area on the 2018 threatened property list due to acute and ongoing threats, but also to significant opportunities—both tied to the past and future of I-81. Opened in 1859, Oakwood Cemetery is a product of the 19th-century Rural Cemetery Movement that fostered some of the earliest works of landscape design in the United States. Oakwood was designed by landscape gardener Howard Daniels, best known for Baltimore’s Druid Hill Park. The cemetery is a local landmark and National Register listed. 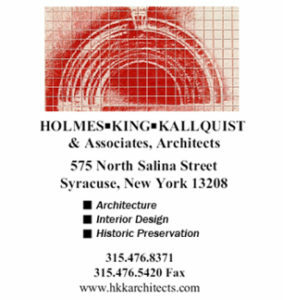 It also received a Medallion Award from the American Society of Landscape Architects in 1999 as one of 362 most important historic landscapes in the United States. 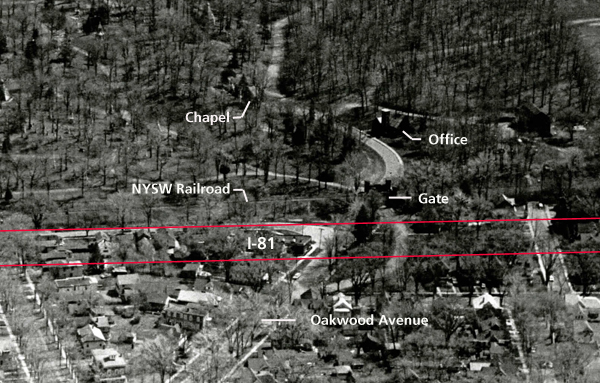 Construction of I-81 in the early 1960s blocked the original entrance to Oakwood Cemetery by inserting a raised earthen embankment parallel to the west side and over the entrance road (Oakwood Avenue). The cemetery owners moved their operations to Comstock Avenue, and the entrance area has since remained a hidden back corner, where once it was the celebrated arrival point and link to the city. Without activity and use, deterioration and vandalism have become rampant. Thanks to the Historic Oakwood Preservation Association, the chapel has been stabilized, but the office building and entrance gates are being heavily vandalized. Many of the landscape plantings, a conservatory, and portions of the entrance road have disappeared. Without viable uses and income to support repairs, the area will continue to deteriorate. 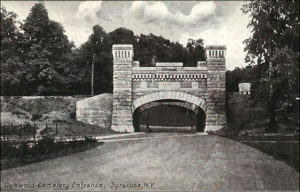 Entrance to Oakwood Cemetery, from present site of I-81, photographed 1909. 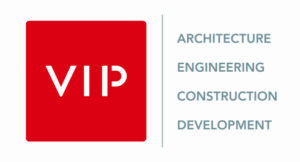 The rebuilding/replacement of I-81 poses a once in a generation opportunity to correct the longstanding adverse effects that I-81 has had on Oakwood Cemetery and especially the original entrance area. While current planning is focusing on the elevated viaduct through downtown, the embankment to the south that fronts on Oakwood Cemetery must also be addressed. Its removal, at least south to Colvin Avenue, would allow for reopening of the original Oakwood entrance and bring new attention and activity to the now abandoned area and the adjacent neighborhood, as well as providing city residents and visitors with renewed access to green space. 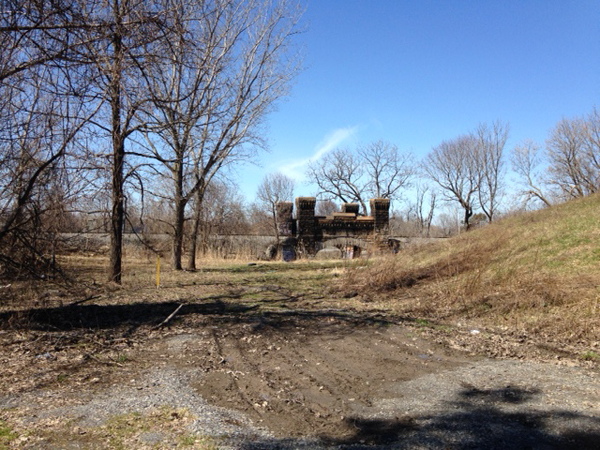 PACNY hopes that its designation of the Oakwood Cemetery entrance area as a threatened property will begin much-needed conversation about the future of the I-81 embankment.